Polls are open until Tuesday, March 25th, 2014 at 11:59 PM EST. Enjoy! Pretty easy votes for me this round, four of my absolute favorites here. 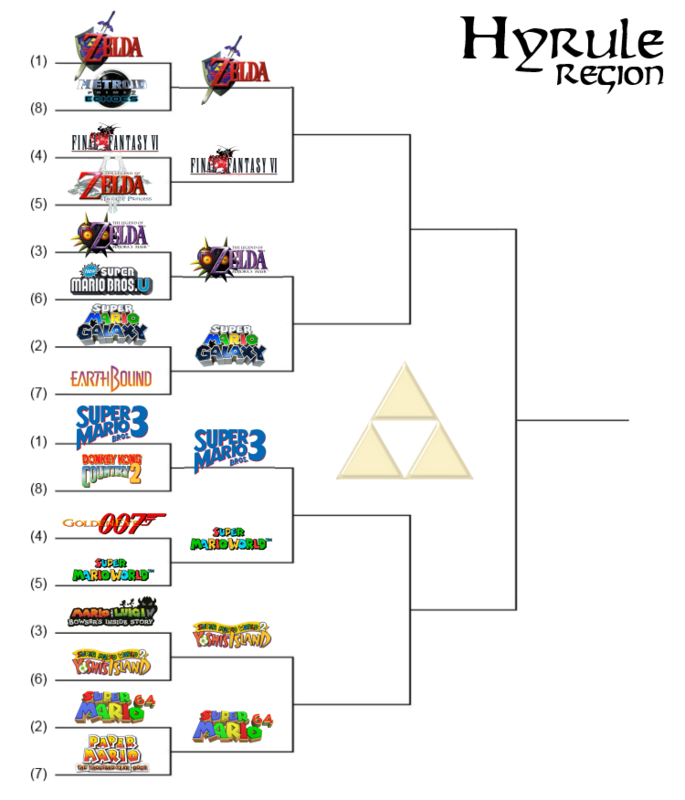 All of these are absolutely fantastic games, but there is only one way for me to vote. Ultimately, Ocarina of Time and Majora's Mask are my top two games ever, so sorry Super Mario Galaxy -- it's up there on my list as well, but just not as high up as MM. 1) Funny one for me. Two games that I like that I don't have strong feelings about. Going with FFVI partly because it's an underdog and partly because i like being known as the guy who tries to put the breaks on honoring Ocarina of Time over and over again. 2) Galaxy by default. But that'd probably be my choice anyway. 3) Been up this road before. Fully expect World to take it, but SMB3 is still my favorite 2D Mario. 4) another where I don't have strong feelings. Yoshi's Island is more unique, particularly in retrospect. But I had more fun with Mario 64. And it set the model for so many games that followed. Fully expect World to take it, but SMB3 is still my favorite 2D Mario. I almost want to sabotage Ocarina's shot because I just know it will beat Majora head-to-head. I thought we'd had a head to head where World took it pretty handily. Maybe I've misremembered or it was far enough back it's irrelevant now. Oh man, now we're getting into the really tough ones. The only clear one here to me is 3 > World. Dunno. I went looking for the poll just now and the only direct matchup I could find was in the All Time Survivor poll where smb3 did indeed beat world. So I'm probably remembering it wrong or confusing it with a Wii Lobby poll or something. I think this bracket has the most heavy hitters. SMB3 vs SMW is brutal. I know Mario 3 will win but SMW deserves to imo. It did what Mario 3 did but better, which was stellar in itself. Easiest round yet for me. 1. Pfft Final Fantasy. Like you can win. Nothing can stop the destruction that Ocarina brings upon you. 2. 2nd best Zelda of all time vs overrated Mario game? Too easy. 3. Ooh, tough. I guess I'll go World because I've actually finished it. Even if this goes against my Yoshi complaints from last week. Also because Kris went with SMB3, and he's trying to destroy Ocarina so we hate him. 4. Seems unfair to do this to the great Yoshi's Island, but Mario 64 has you beat. A: A few years ago, I would've gone OoT. But FF3 has stood the test of time and is simply magnificent. I think a future Zelda has a shot at topping OoT, but I have trouble picturing an RPG ever beating FF3 in my eyes. B: This was a close one, I can't really decide so I went with SMG since it seems to be the underdog and I think MM gets a little overhyped. C: SMB3 blew my mind. This one really took platformers to the next level. World was great, but it wasn't quite the level of progression as Mario 3, and even a step back in a few ways. D: Gotta go with the trailblazer here. A1. Ocarina is just too good. B2. Hard choice. Since it stands no chance of winning, I'll vote for Yoshi's Island. I guess me and @Hero_Of_Hyrule just cancelled each other out, haha.